She's a treasure. She's a treat. She's straight from heaven! At least she will be when she goes in this girl's Angelic Maiden costume for children. She might still be working on her heavenly choir voice, and maybe you've had a hard time tracking down a portable harp for her (Pro tip: always choose a portable harp. Trying to fly with a full sized one is a non-starter! ), but we think she's ready to spread her wings and start spreading the gospel of how to have a good time at the party! 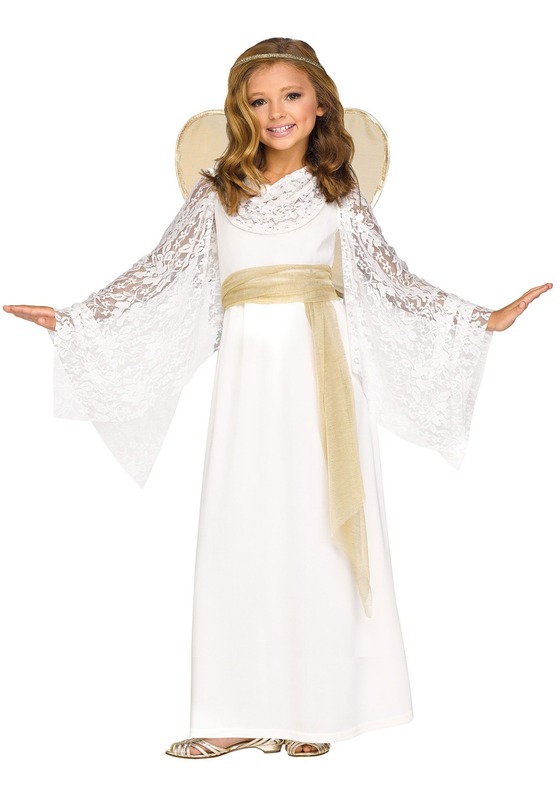 This Child Angelic Maiden Costume is perfect for Halloween, Christmas, plays, and more! With classic angel styling, she'll look heaven sent, even if she's just an ordinary day-to-day girl. An all polyester gown has draped lace sleeves and features a lace scoop cowl for angelic elegance, the golden sash secures around her waist to give the ensemble an exquisite touch. Wire frame wings secure to the back with elastic straps, and will have her looking like she just flew in for a harp jam session! Complete her look with the included metallic headband and pick up a pair of golden sandals (sold separately) to complete the look. When she's decked head to toe in this heavenly costume, we're pretty sure you're going to be able to hear that choir start singing! My daughter loves this costume. It was perfect to fit. Will definitely shop here again.